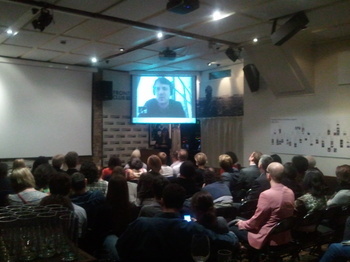 After last night’s screening of We Are Legion, Director Brian Knappenberger Skyped in to the Frontline Club for a Q&A. He had hoped to attend the screening in person, but his Skype call came from the Californian hospital where he had only a few hours earlier become a father. The audience greeted his appearance on screen with a rapturous round of applause, congratulating him not just on his recent progression into fatherhood, but on a thoroughly enjoyable and educational documentary about the origins, achievements and pitfalls of hacktivism. We Are Legion tracks the evolution of hacktivism from the ludicrous website 4chan- a mish-mash of memes, revolting images and heated discussions about Manga- through to the formation of Anonymous, which builds its backbone from declaring an international war on Scientology and gains it political purpose from Wikileaks and the battle for free information on the internet. Through interviews with hacktivists, scholars and the victims of hacking, we learn more about what motivates some members of this diverse group of young idealists. The post-screening Q&A covered a range of issues raised in the film, from the problem of jurisdiction when prosecuting hackers for criminal activities, to Mubarak’s government’s attempts to "shut down the internet" during the Egyptian revolution. Knappenberger was cautious in making predictions about what Anonymous is likely to do next, their very unpredictability has been their defining feature to date, but the audience was left without a doubt that hacktivism is a powerful new force in the world with both high-minded aspirations and a destructive streak, tempted to set the word alight to watch it burn. Visit the film’s website and view a detailed timeline portraying the development of hacktivism.